Hotels located in Cabo San Lucas offer you the best of both worlds – being close to downtown Cabo while still having the luxury of swimmable beaches like Medano Beach. 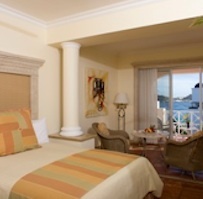 Located on Medano Beach, Pueblo Bonito Rosé Resort & Spa is just a short walk to town. Guests can enjoy the exciting nightlife of Cabo San Lucas, relax by the pool, pamper themselves at the spa, or dine at award-winning Fellini’s Ristorante. An optional all inclusive package gives you access to onsite restaurants and bars, as well as dining at the nearby sister resorts. With tons of amenities, the Pueblo Bonito Rosé Resort & Spa is the perfect place to unwind.